Artist's Comments: Although Hualalai's Beach House Restaurant has been sitting along the shore for over 14 years; it undergoes a daily transformation at sunset. 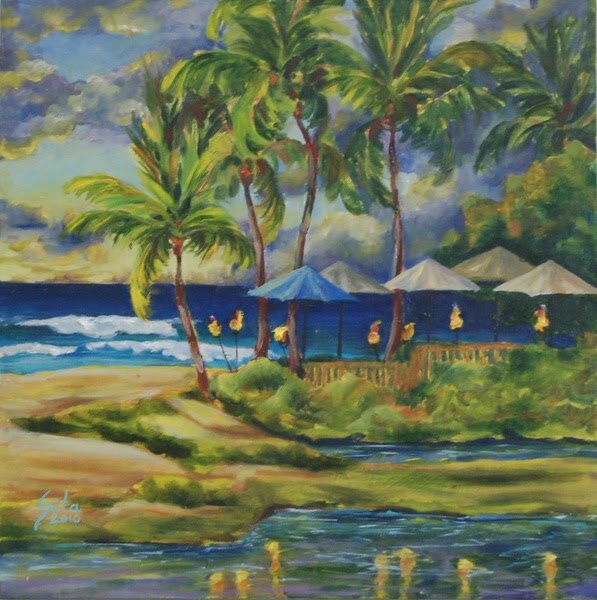 I have painted this restaurant a few times and each sunset offers such a different experience. At times, there is little to no cloud cover in the sky so the sunset is a simple yellow globe descending beyond the horizon. At other times, the sky opens in a valiant burst of color keeping you engaged – hoping for a green flash. Because no two sunsets are alike, when I was asked to paint a sunset with yellow tones in it, it took me some time and patience to wait for these colors. High winds visited the Big Island for two weeks straight taking away all the lovely clouds that capture the sunset rays. Finally the day after a wildfire swept through Waikoloa Village, the ash mixed with the atmosphere to bring some color to the evening show! Soft purples and blues mixed with yellow tints to create another surprise sunset. The glittering tiki torch reflections were icing on the cake!